$24 or less after FAB discounts. (Reg Price $30) Free Shipping! No further volume discounts on this sale item. Gauge: 5 stitches = 1"
Please note: We don't reorder these colors on a regular basis because they are Pre 2011 colors from Artyarns. If we do not have enough on hand, you may special order these colors. Please note - we are updating the photography - there are LOTS more colors in the drop down! 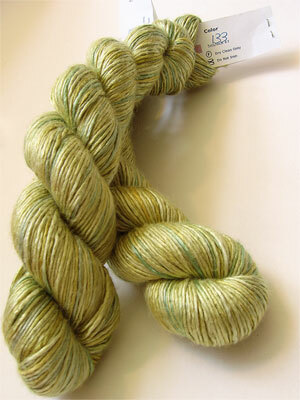 Gorgeous Handpainted Silk Yarn in a stunning array of colors, from wild to delicate. Great for baby hats, blankets. 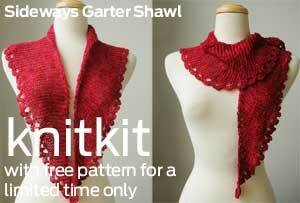 Regal Silk Yarn will work with a wide array of patterns. It makes a warm, but lightweight garment, that is always a pleasure to wear close to the skin regardless of how warm the weather is. Great yarn for baby booties or light summer hats - it's a great gift for a baby knitting project! 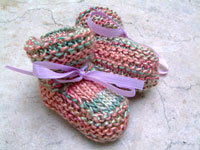 One skein will get you a hat and booties for baby. Don't forget to sign up for our email list to get advance notice of new yarns, sales, and special events!